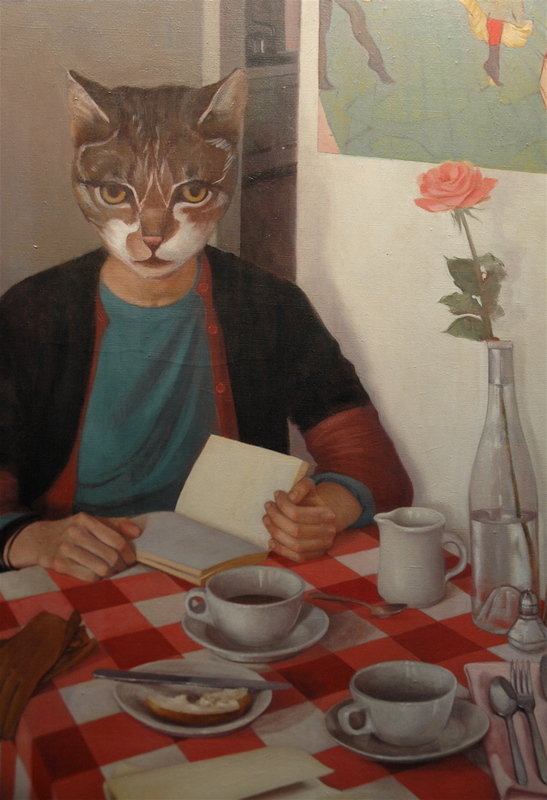 In the "better late than never" category, I would like to give a shout-out to Fran Beallor whose lovely exhibition, Accidental Encounters has its last day at the Hudson Guild Gallery this Saturday, February 24th. Join her that day for a closing party from 1 to 4 pm. 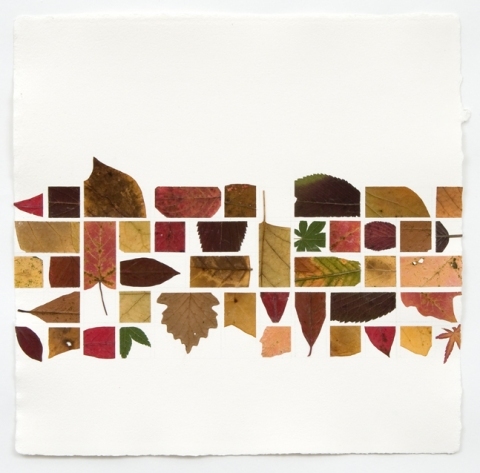 For those interested in community and how to get more people looking and thinking about art, the Hudson Guild Gallery program is one to follow. 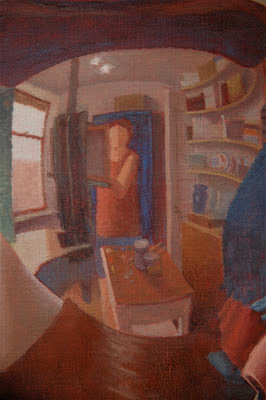 For many years, Jim Furlong has been bringing high caliber shows to Chelsea residents who would never dream of venturing a few blocks further west to the gallery district: seniors, after school groups and the folk who live in the public housing projects surrounding the Guild buildings. A series of talks accompanies each show and I was pleased to hear Fran speak about her work at one such event. 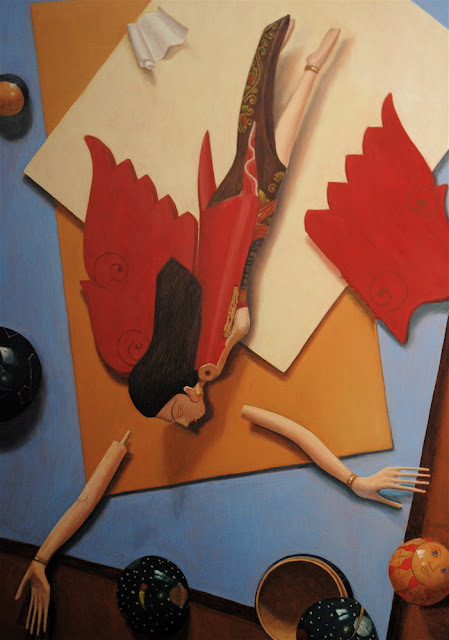 Fran is a deft painter with a long history of exhibiting around the realist painting scene in New York City. She has rather hair raising stories to tell of how 57th Street art dealers treated young artists in the 1980s, as well as inspiring stories of learning to paint from her mother, also an artist, and in the studios of a variety of New York artists. The elderly audience was astute and appreciative of both the artist and the curator, who acted as interviewer. 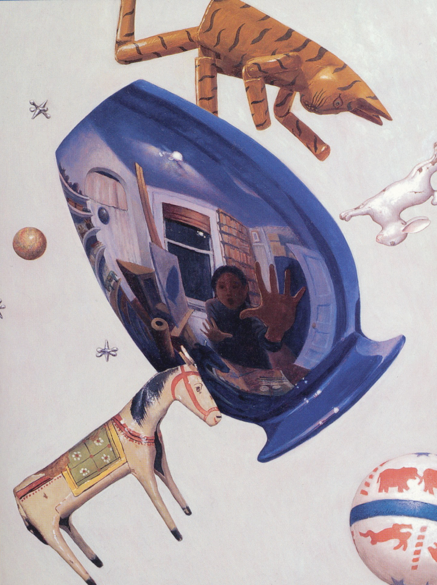 I was especially taken with Fran's falling figures and also with the reflected interiors seen in the shiny surfaces of vases and pots in some of her still lives. 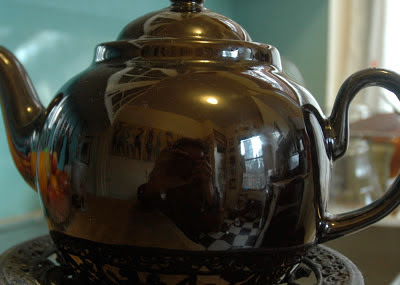 And I was delighted to discover an interior of my own lurking in the curved surface of our Brown Betty teapot when I got home! 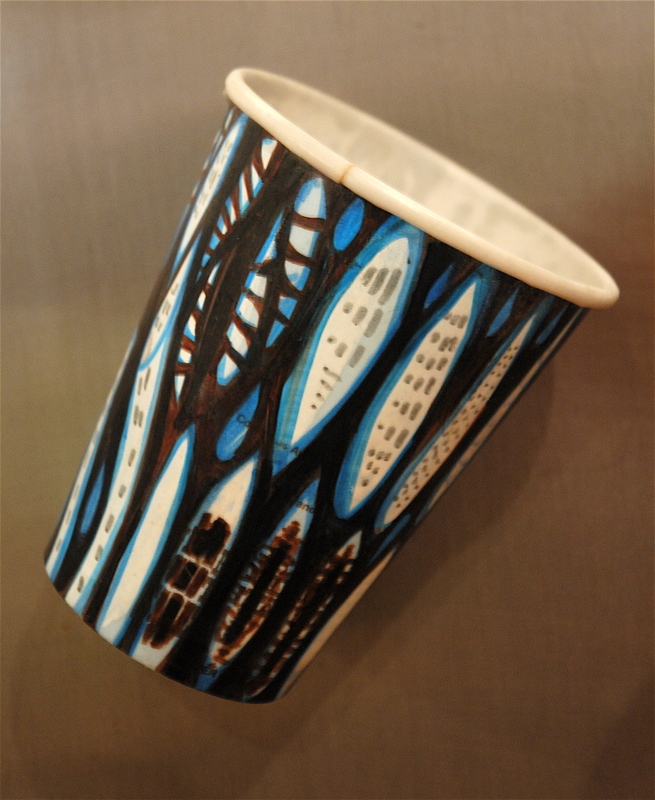 The Hudson Guild Gallery is located at 119 9th Avenue (between 17th and 18th street) in NYC. 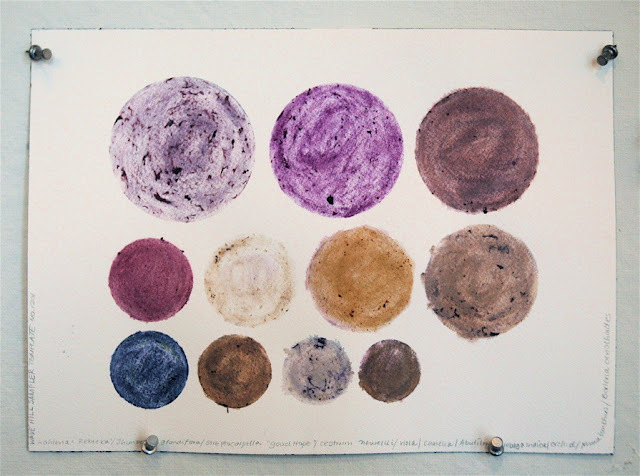 See more of Fran's artwork from March 8 - 10 when she exhibits with the Hullaballoo Collective at the Fountain Art Fair, at the 69th Regiment Armory on Lexington Ave & 25th St, NYC. It was harder than it looked. Twelve of us sat around tables in Wavehill's elegant Glyndor House where the galleries are turned into art studios during the winter. 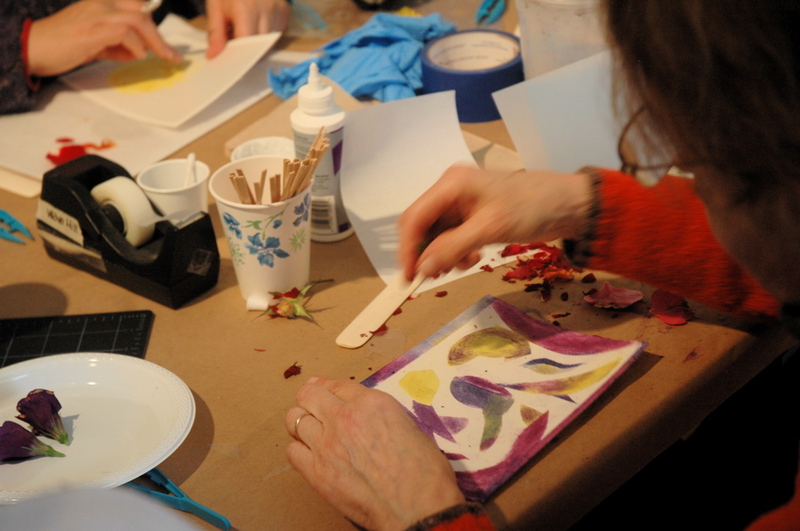 It was a chill, weekday morning and a mix of plant-lovers, gardeners, artists, retired seniors and one home-schooled child were taking Linda Stillman's workshop, "Preserving Flowers through Art". 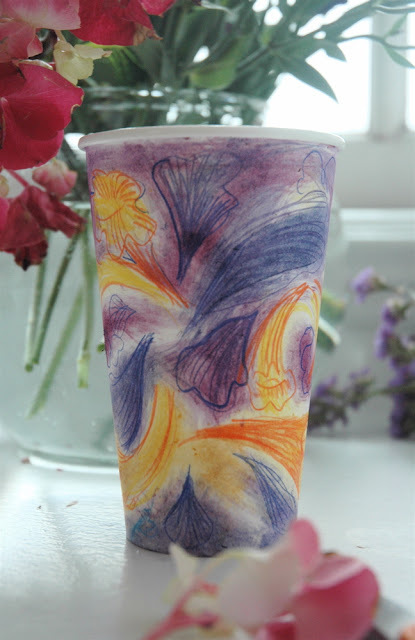 We struggled with blue plastic tweezers, toothpicks dipped in glue, and the frailest of dried flower petals. 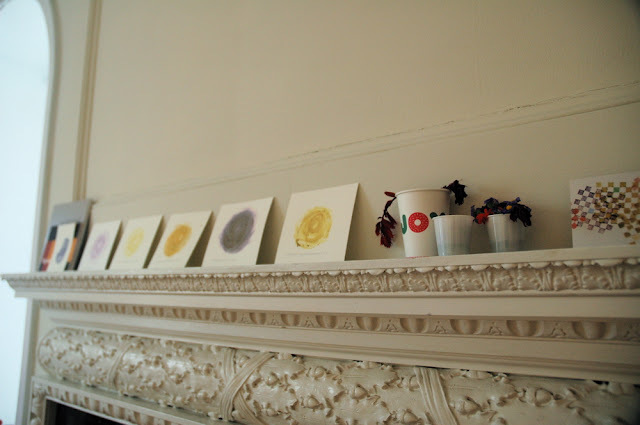 Linda, artist in residence, had described the process in detail and we had studied her flower collages just moments before. Now, trying it for ourselves, we discovered that we were all thumbs. 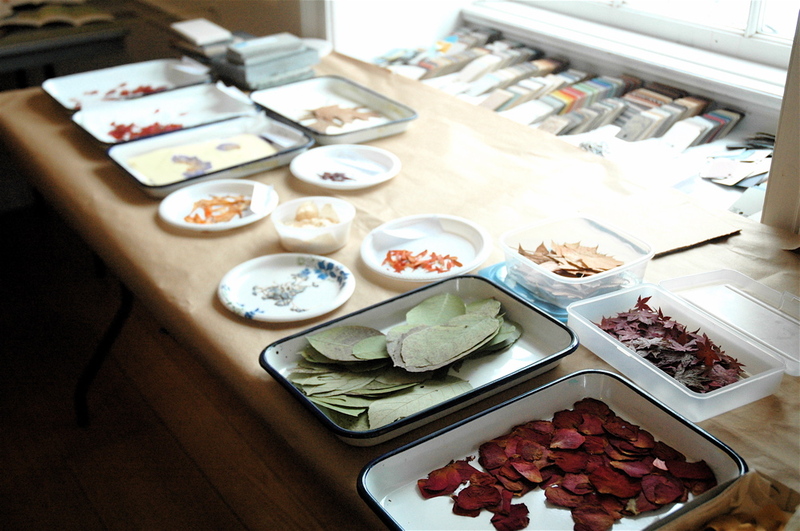 Pressed and dried flowers and leaves ready for collage. 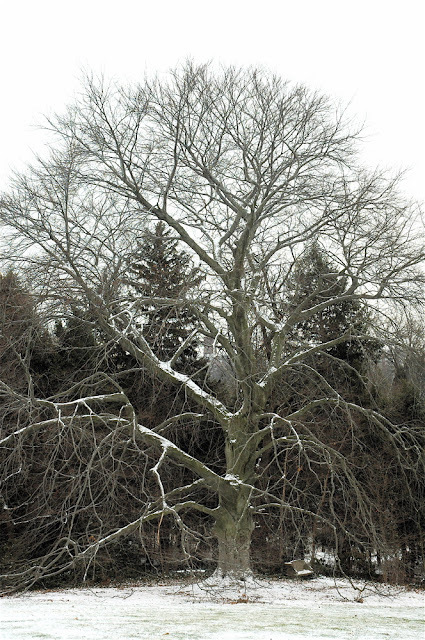 Outside the windows of the warm studio, the lawns, trees and Adirondack chairs of Wavehill, a public garden and cultural center in the Bronx, were stark grey and white after a light snow. The Hudson river was a strip of steel in the distance, with the snow-sieved Palisade cliffs rising beyond. 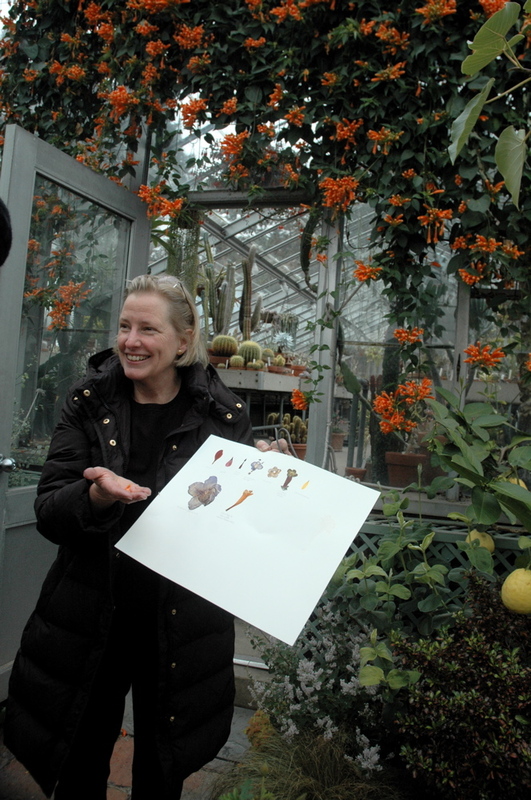 Once we had completed our own rough attempts at collage with pressed and dried plant material, we bundled into coats and Linda walked us across the dormant garden to visit the glasshouses. We were delighted by the brilliantly chromatic and steamy greenhouses. 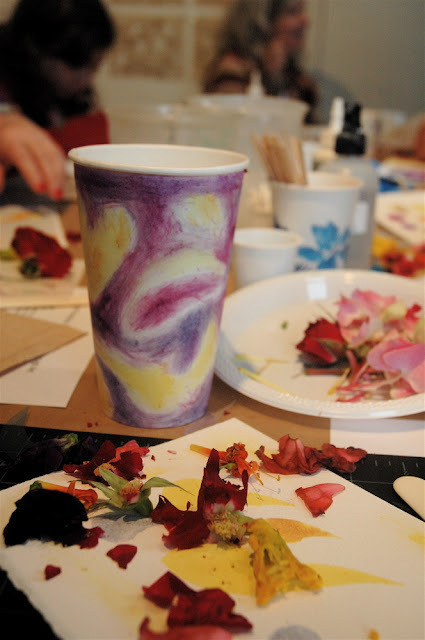 Here were the blooming plants whose fallen petals we would use in the second part of the workshop - stain painting with flowers. Having picked up the pot of windfall blossoms gathered for her each day by the gardeners, Linda took us back to her studio to learn how to cut stencils. Then we began applying the rich pigments of hydrangea, fire vine blossom, rose and daffodil by rubbing and crushing the fresh petals directly onto watercolor paper. After several hours, surrounded by the detritus of ruined flowers, we had some brand new experience with pressing flowers (save those old Yellow Pages books. They are just the thing!) 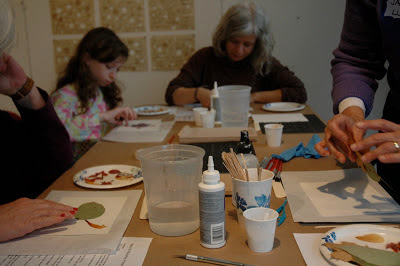 making collages with dried plant materials and painting with the delightfully vibrant colors of fresh flower pigments. Above all, we were filled with admiration for the virtuoso precision of Linda's own collages and the wide color range of her flower stain artworks. Linda's workshop was one of a dozen offered during each session of the Wavehill Winter Workspace residencies. Advance registration is highly recommended. For more information, click here. To see Linda Stillman's botanical artworks and daily sky paintings, visit Wavehill's Glyndor House this Sunday February 10th. Her studio, along with five others will be open to the public from 1:30 - 3:00 PM. 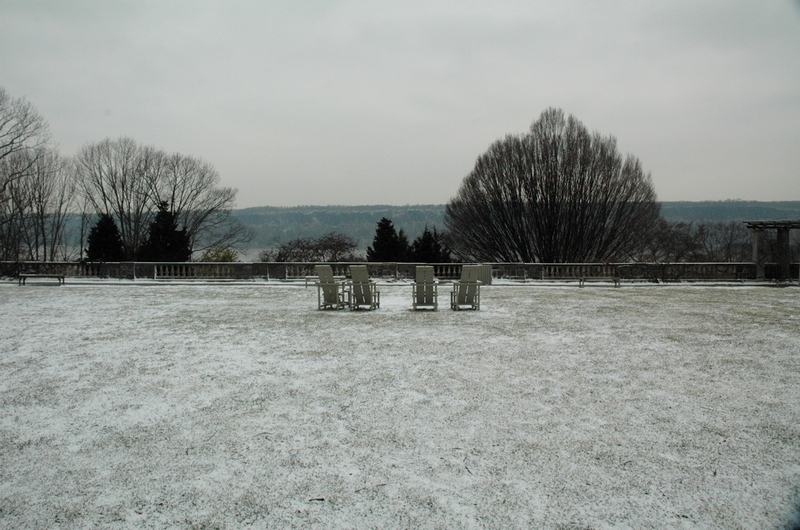 Wavehill, a public garden and cultural center, is located West 249th Street and Independence Avenue in the Riverdale section of the Bronx. View directions. For more information about the Winter Workspace program click here. Visit Linda Stillman's website at www.lindastillman.com. Have Gwyneth's Full Brew cups and stories delivered directly to your inbox!